Keeping your visitors engaged on your site has been one of the biggest requirements of online businesses and blogs. More chances of visitors converting into customers. Better SEO rankings due to higher dwell time! There are lots of tools available to keep your visitors engaged, making sure that they don’t leave your site quite early. Out of those, we’re comparing two famous tools – Icegram and GetSiteControl. Although both the tools are specifically made for conversions and visitor engagement, both of them are different; looking at the types of tools they provide and in the sense that Icegram is more oriented towards WordPress while GetSiteControl is a SaaS application. Let’s move onto the complete comparison of Icegram vs GetSiteControl, how they compare against each other, and which tool can provide you better results! Which tool provides better results? Although Icegram and GetSiteControl being different in nature, their goal is same – providing better conversions and more visitors engagement. After you activate GetSiteControl you have to first sign-up and only then can start using it. On the other hand, there is absolutely no sign-up needed for using Icegram. You can direclty activate it and start creating your optins right away. The main difference between both these tools is their architecture. Icegram is divided into Optin Types where each of the optin types can be highly customized according to the requirement. GetSiteControl is divided into goals and each goal provides all the optin types available. Icegram provides a wide variety of optin types( 4 free + 8 premium) to ensure that your optin stands out from the crowd. While on the other hand, GetSiteControl provides only 4 optin types to the industry standard ones. With this, it’s clear that Icegram provides you with the flexibility to show your optins in so many extra ways! 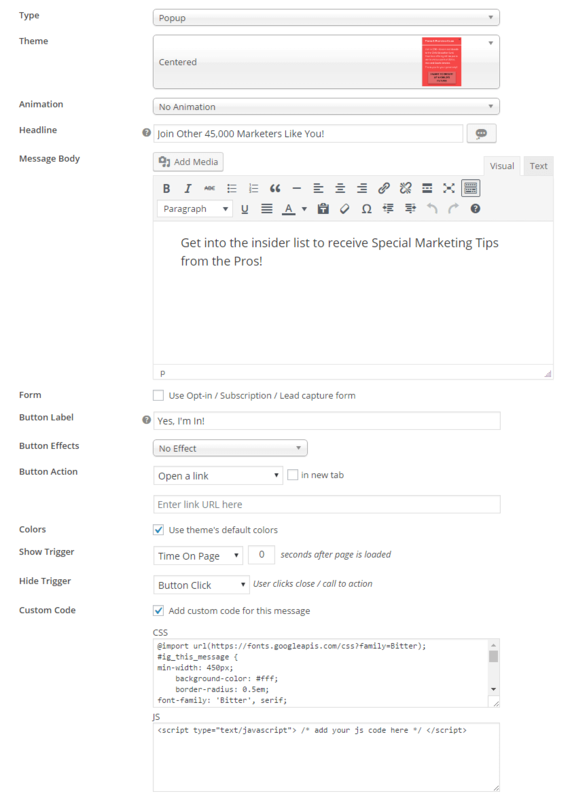 A greater advantage with Icegram is – It’s a WordPress plugin, so many more possibilities are still available like Widget Area and Below Content optins and more! Use cases refers as to how you use the optin types for your audiences- ask for a sign-up, display important optins, ask visitors to follow your brand on social media, etc. As you can see, GetSiteControl is more about keeping your visitors engaged while Icegram focuses more over better conversion rates! Icegram provides the option to add ANY MEDIA FILE-png image, gif image, video,etc. to the optin types even in the FREE version. On the other hand, GetSiteControl provides the option to add ONLY IMAGES and that too only in PLUS and PRO version. Icegram is a customization wonder. 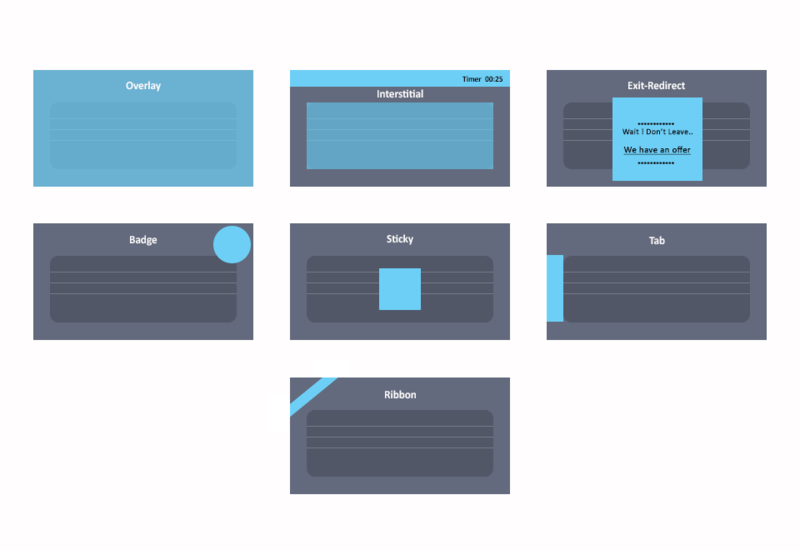 You can customize each and every theme template, change background and button colors. Also, you can write your own CSS to beautify the content in optin types. Icegram provides 20 free themes. It has a whopping collection of 74 awesome themes(Free+ Paid). Icegram's new feature Gallery provides you with some of the most beautiful templates premade for you. Click To Tweet You don’t have to do all the hard work; they’re completely ready for instant use! On the other hand, GetSiteControl provides pretty basic customization features. It looks pretty plain. There’s no modern design, no unique look. All are those same good old square designs. On the other hand, GetSiteControl has branding in it’s free as well as Plus version. Branding is removable only in the Pro version. Both Icegram and GetSiteControl are at a cutting-edge when it comes to Behaviour Triggers. Both provides robust options of triggering optins. As you see in the above table, Icegram has got a little edge over GetSiteControl providing a trigger to show a message after the user is inactive for x seconds. Here again, Icegram has got an edge over GetSiteControl providing more Hide Triggers. Note: These advanced Icegram triggers are possible through the Behaviour Triggers Add-on. Targeting can be super-beneficial when done the correct way. If you show correct messages to correct people, your conversion rates doubles if not triples! That’s the real potential of targeting. Here’s where GetSiteControl gets an edge over Icegram. 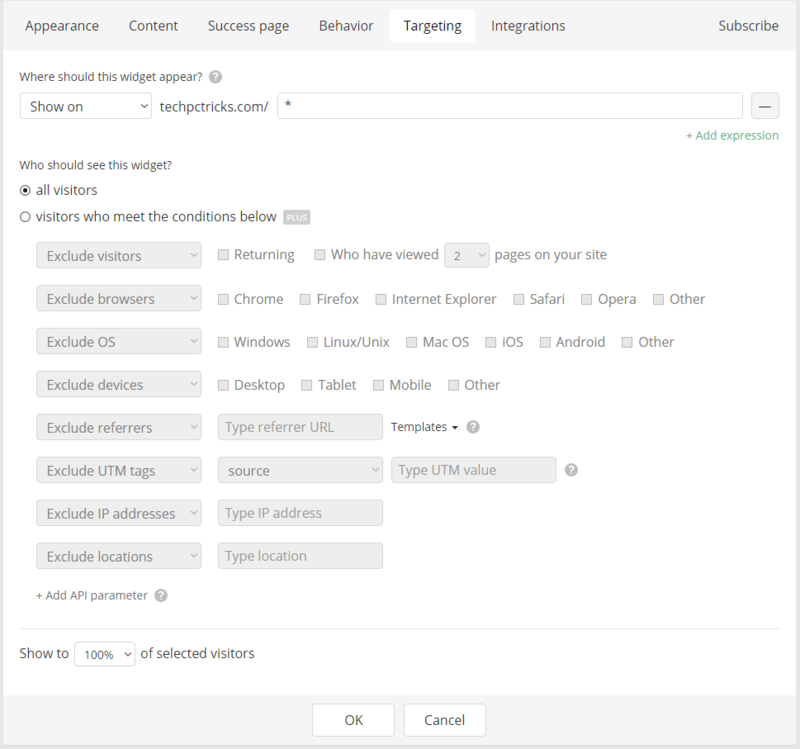 While the more important WordPress post-pages targeting options is available in Icegram and not in GetSiteControl, it lacks behind at targeting by Browsers and OS as it’s a WordPress plugin. After successfully converting a visitor to into subscriber, you need to forward it to your mailing list provider. These includes MailChimp, AWeber, Constant Contact, Campaign Monitor, ActiveCampaign and Mad Mimi. So, if you are with some another mailing list provider, you can’t integrate your subscribers with them, or you’ll have to wait until GetSiteControl brings in integration with them. 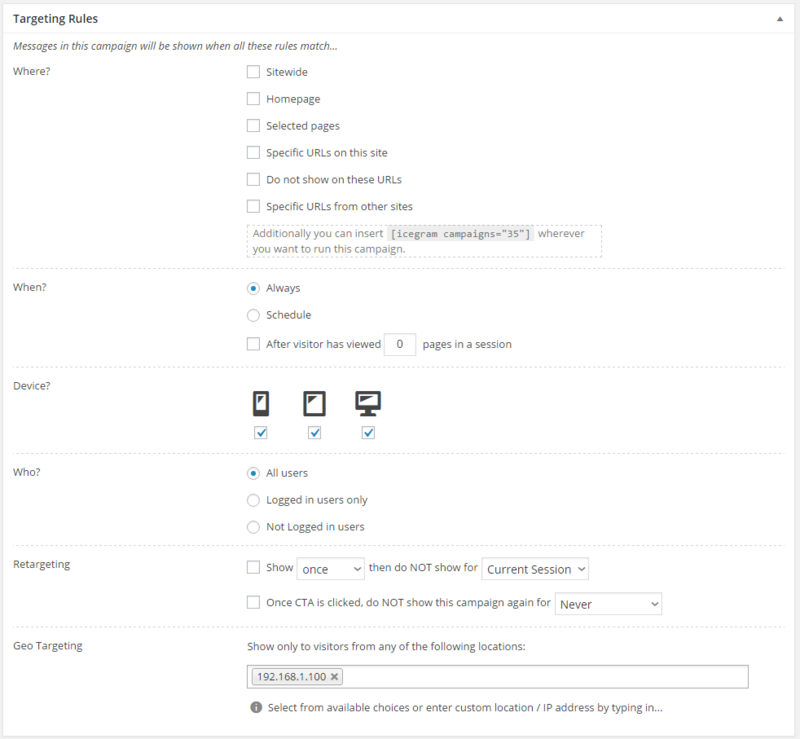 With Icegram, you can create unlimited campaigns with 20 High Converting Themes, and some powerful targeting options in the free version. If you want to extend its functionality, Icegram provides different add-ons separately priced. So, you can choose the one which you need. There’s also a Super-Bundle pack which consists the major add-ons packed-in together for $99/year. 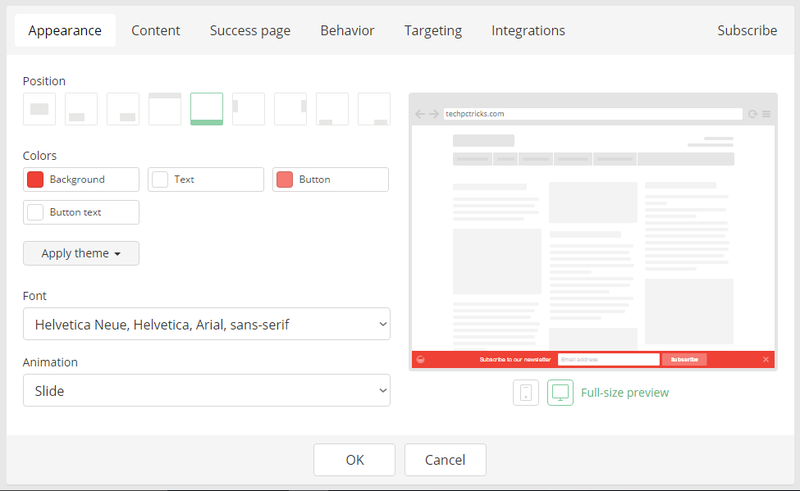 With GetSiteControl as well, you get to create unlimited Goal Types and customize them fully in free version but you are forced with their branding. There’s also a Plus version which has branding priced at $96/year. And if you want to remove their branding, you need to purchase the Pro version priced at $192/year. If your aim is converting your site visitors into subscribers, Icegram should be your preferred choice. If your aim is getting more traffic and engagement with survey and contact tools, GetSiteControl should be your choice. Which one would you prefer? Let us know in the comments below. However, GetSiteControl does offer a WordPress plugin, so this bit is not exactly accurate: https://wordpress.org/plugins/getsitecontrol/. Thank you for getting it to my notice. I did some testing and added the Sign-up section to give readers a clearer view on how to start using these plugins.